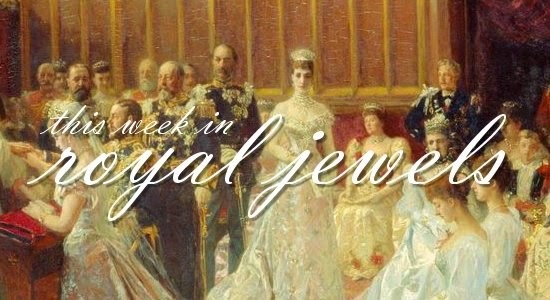 With the craziness of Royal June winding down, we're back to our normal posting schedule with a weekly roundup of royal jewels! Our posts on the Queen's state visit to Germany are here and here -- now let's see what some of the other royals have been up to, shall we? 10. On Saturday, the always-glamorous Charlotte Casiraghi wore an interesting pair of geometric hoop earrings at the annual equestrian jumping event in Monte-Carlo. 8. On June 30, the Duchess of Cornwall wore an especially meaningful elephant pin at a fundraiser for the Elephant Family, a charity started by her late brother, Mark Shand. You also get a good look here at the small necklace she often wears under her larger necklaces. Not sure what the small pendant is made of, but it's lovely. 7. For the Hampton Court Palace Flower Show on Wednesday, Camilla went with pearls. 6. The Fete Imperiale in Vienna this weekend drew a royal crowd, including Eilika von Habsburg (the sister-in-law of the head of the Habsburg family), who wore a triple-stranded pearl necklace. 5. Infanta Elena of Spain also attended the Fete Imperiale, wearing aquamarine earrings, a diamond pendant necklace, multiple bracelets, and the insignia of the Order of Charles III. 4. Tatiana of Greece and Denmark selected an intriguing modern pair of earrings for an event at the Natural History Museum in London on Saturday. 3. Queen Maxima of the Netherlands wore an enormous pair of jeweled tassel earrings on Wednesday during her trip to the Philippines. 2. The Spanish royals are on a state visit to Mexico this week. Queen Letizia debuted a new pair of Tous ruby and emerald earrings on Monday in Mexico City. 1. Letizia also gets my top spot this week for the gorgeous diamond pendant earrings she sported during the state banquet in Mexico.